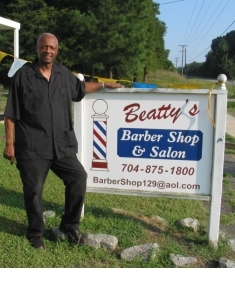 Welcome to Beatty’s Barbershop which located in the Lake Norman Area at the north end of Charlotte. Our address is 12900 Statesville Road, Huntersville, North Carolina 28078. We are a diverse barbershop/salon with a one to one relationship with our clients. We cater to all age groups. Walk-ins are welcome. We offer free wireless internet access to our customers. Beatty’s Beauty Salon Hours of Operation are by appointment only. For an appointment call 704-875-1870. On Wednesdays, we’re offering free children’s haircuts. Offer starts 8/29 and is good until further notice. We’ll see you on Wednesday! Learn about the Easy Does It Alcoholics Anonymous Group that meets in David’s Place. 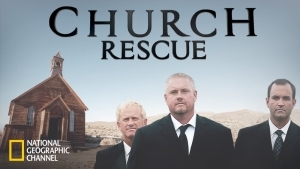 appeared on an episode of the National Geographic television series, Church Rescue. During the “Full Gospel” episode, the Church Hoppers Rev Kev, Gladamere, and Doc stopped in to the barbershop to discuss how they’d help a local church. Learn more. Also, learn about our Bible Study.